Join us at the opening reception on 5/2 for free wine and beer, with the artist in attendance! The Made in NY Media Center by IFP is proud to present Dwelling in the Fuchun Mountains, a generative digital art installation that created by artist James Yuxi Cao as part of his QRC (Quick Response Code) project. Utilizing the halftone pattern machine learning technique, the artist transforms visually random QR code patterns into images recognizable by humans while still retaining the original scanable function of a QR code. With the global technological evolution of image recognition and the proliferation of mobile devices, the QR code has become ubiquitous in recent years, transforming into a visual symbol for social context within the current digital economy. In the rapidly rising economies of China and most other Asia countries, QR codes let you hyperlink and bookmark the physical world, enabling everything from financial transactions to adding a friend’s contact, subscribing to a news feed to renting a bike or car, to taking the bus or subway. Overwhelmed by the global QR code wave, James Yuxi Cao found that the abstract pattern of the QR code was a perfect visual sample that possessed an interactive nature, critical cultural meaning, and social context. 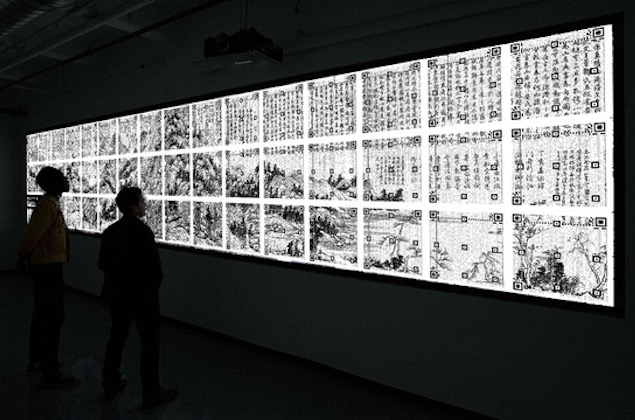 As such, he reprinted an ancient Chinese panting, Dwelling in the Fuchun Mountains, with the QR code visual pattern by using the machine learning technique. The original work is a long hand-scroll painting done by Huang Gongwang between the years 1348 and 1350, depicting a landscape in the area around the Fuchun River where he was traveling and residing. The Fuchun river is located in Zhejiang, China, historically famous for trade and a rich economy. In modern China, the painting is frequently referenced as a culture symbol for flourishing economical accomplishment. James Yuxi Cao is a artist and coder based in New York City who designs, collaborates and consults on creative projects across a wide spectrum, ranging of sound-visualization to programming and computing. His innovative approach to creating art and incorporating technology has enabled him to generate and shape numerous design projects including space design, new media art installation, and public art in both China and the U.S.